A few Saturdays ago we saw the hottest day of the year so far in the North East with temperatures reaching a pretty tropical 25 degrees. I love sunny days in the UK, it's always great to see people out and about with big smiles on their faces. As the crowds descended to the coast for the Sunderland Air Show or Newcastle Racecourse for Ladies Day, Simon and I decided to hop on the train and journey into Northumberland to visit Corbridge. The trip takes around 30 minutes from Newcastle and if two adults are travelling you can take advantage of the "Duo Ticket" which allows you to purchase one return and get one half price. 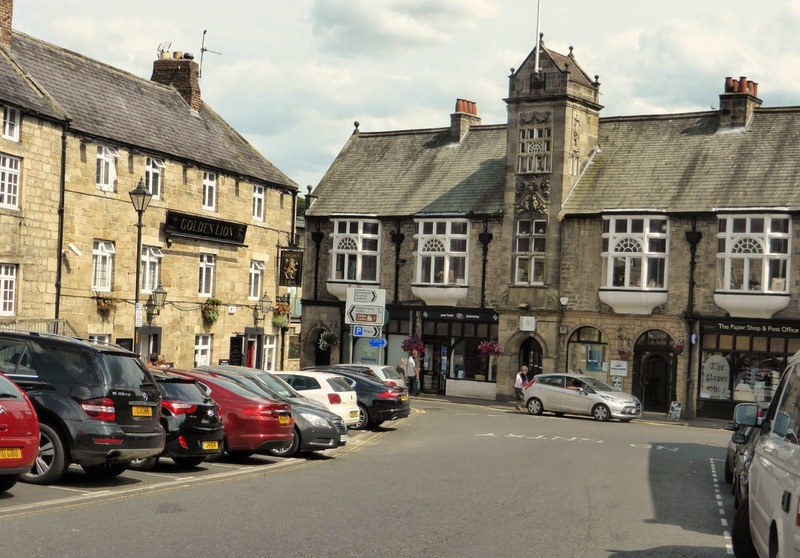 Corbridge is in the heart of Hadrian's Wall country and is hugely popular with tourists. Its river views, stone buildings, leafy church and pretty high street make it a postcard perfect town. The short walk from the train station took us over a 17th century stone bridge crossing the Tyne with beautiful views across the river and countryside. We had a lovely few minutes peering over the edge to watch the families paddling in the river below us, it looked like such a lovely way to cool off in the heat. 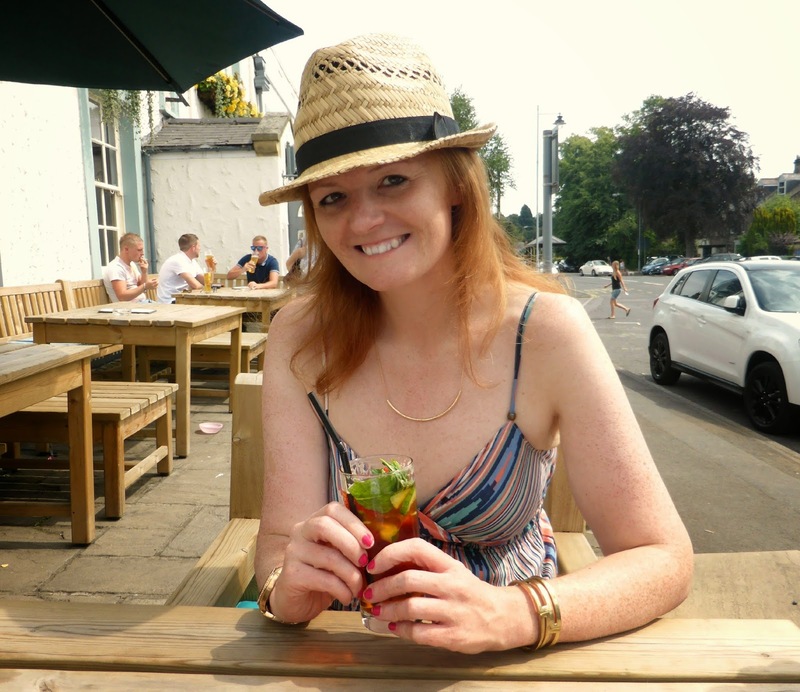 Being a sensible red-head I made sure I was wearing a nice cool maxi dress, covered myself in factor 50 and put a sun hat on. However I still managed to use the heat as an excuse to stop at the Angel Inn for a nice glass of refreshing Pimms in the sunshine. 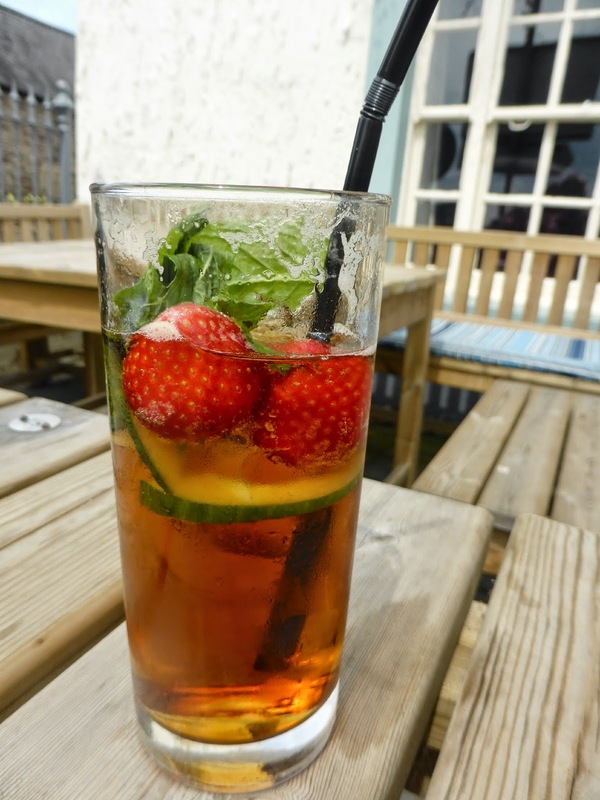 I don't often drink alcohol but I'd definitely describe myself as a "sunshine drinker", as soon as the weather is nice I love to sit outside with an ice cold glass of Pimms, Cider or Wine. 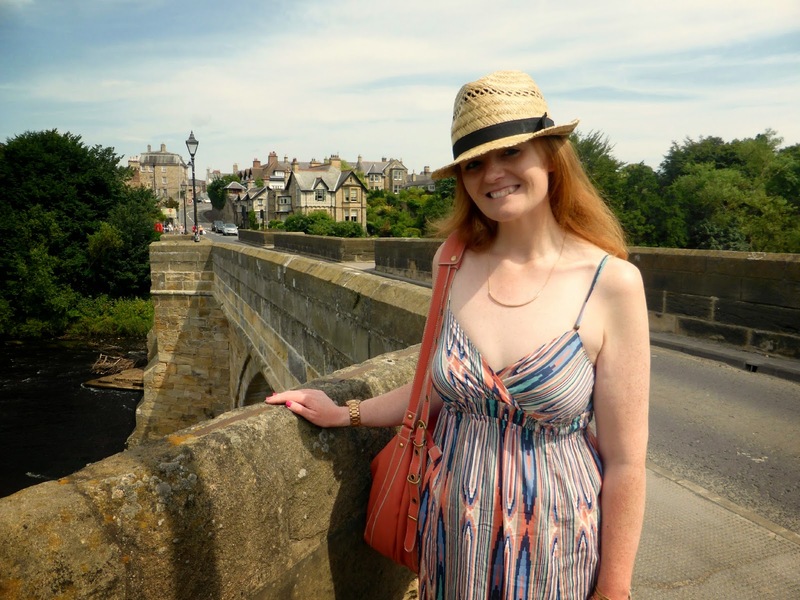 Once we'd cooled off we continued our adventure exploring the streets of Corbridge and popping in and out of a few of the shops. 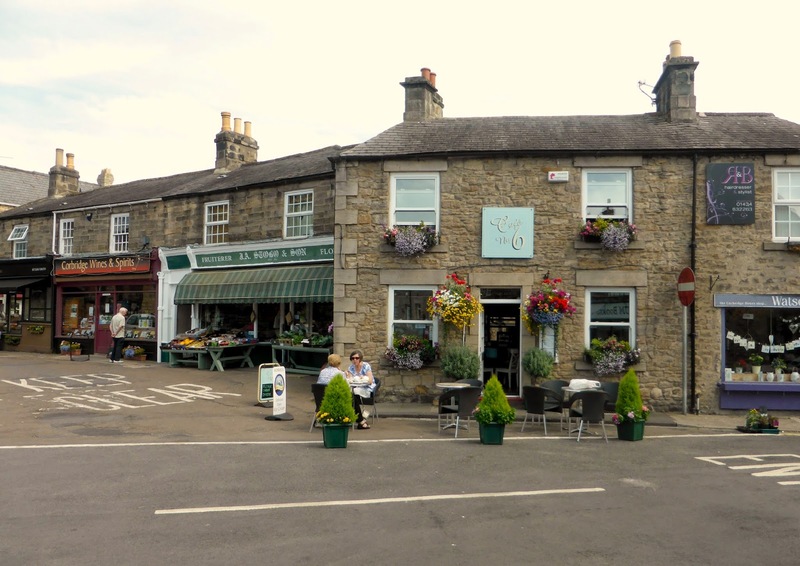 If you love shops full of cards, gifts and cookwear then you'll definitely need a trip as Corbridge is full of them. One of my favourite shops is the Alex Clark Card and Gift Shop. Alex is a very talented artist from County Durham here in the North East, who draws the most wonderful pictures - usually featuring animals and the countryside. Her designs are so cute and I can never resist picking up a few cards. My poor Mum has recently broken her ankle so I picked her out an adorable Get Well Card featuring a fluffy ginger cat to cheer her up. 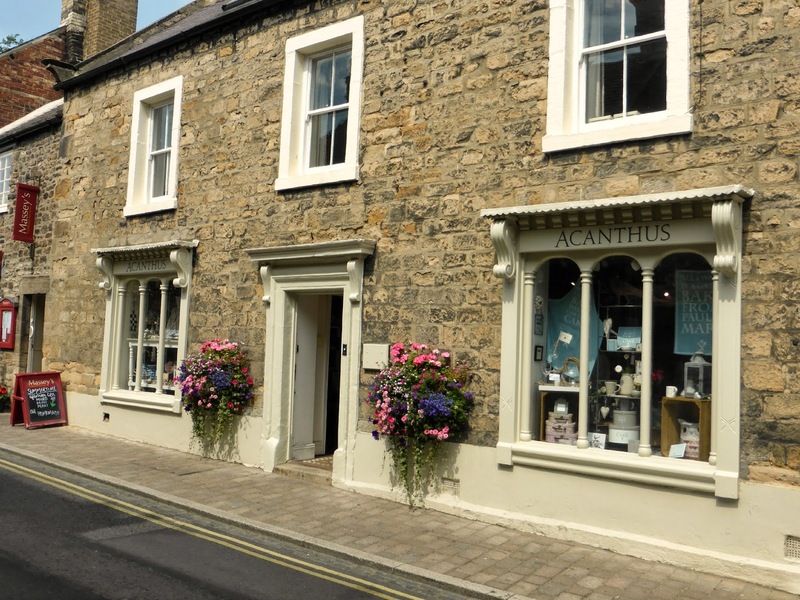 I really love strolling around beautiful old towns and in Corbridge you'll find every shop in the prettiest building, even the Bank and Boots look stunning. 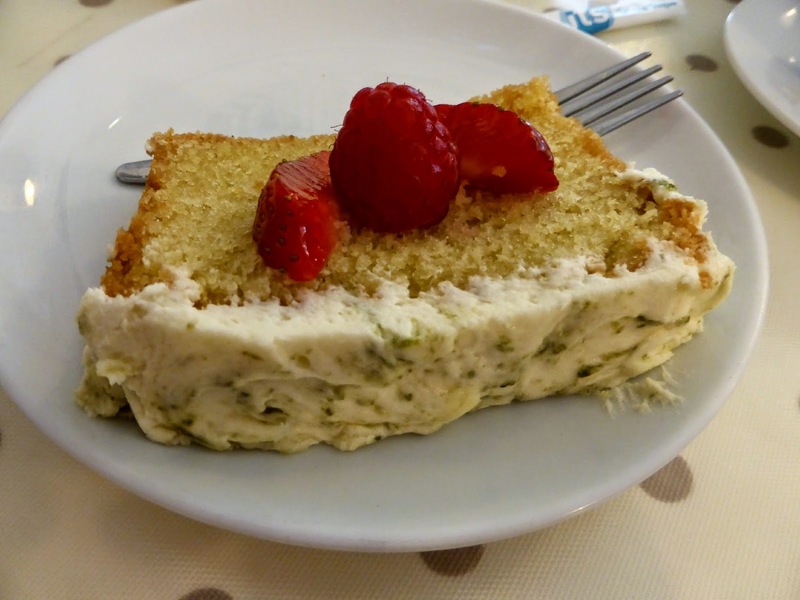 Of course a day trip wouldn't be right without cake and there are quite a number of tea rooms to choose from in Corbridge. We walked past each one to have a little look at the cake displays before deciding on Massey's Tea Room which is housed in a stone cottage. They had a nice selection of cakes to choose from as well as offering three different types of afternoon tea. It's the perfect place to head if you fancy a small treat as you can pick from a micro (mini scone and mini cake), a mini (mini sandwiches, mini scone and mini cake) or a maxi (full afternoon tea). Simon is on a health kick at the moment so he chose the micro and it was the perfect size with a small cherry scone and mini raspberry and cream tartlet. I was a little greedier and opted for a full size slice of lime and coconut cake and I have no regrets because it was absolutely delicious. 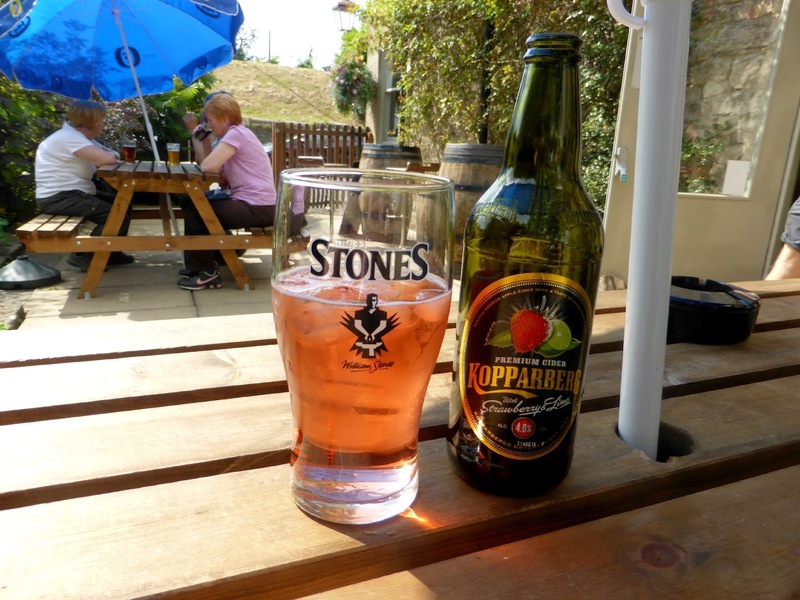 After a bit of a further nosey round the town, and me trying to resist the urge to look through people's windows we headed to the Dyvells Inn which had a lovely amount of outside seating so we could enjoy some more sunshine with a refreshing glass of strawberry and lime cider. 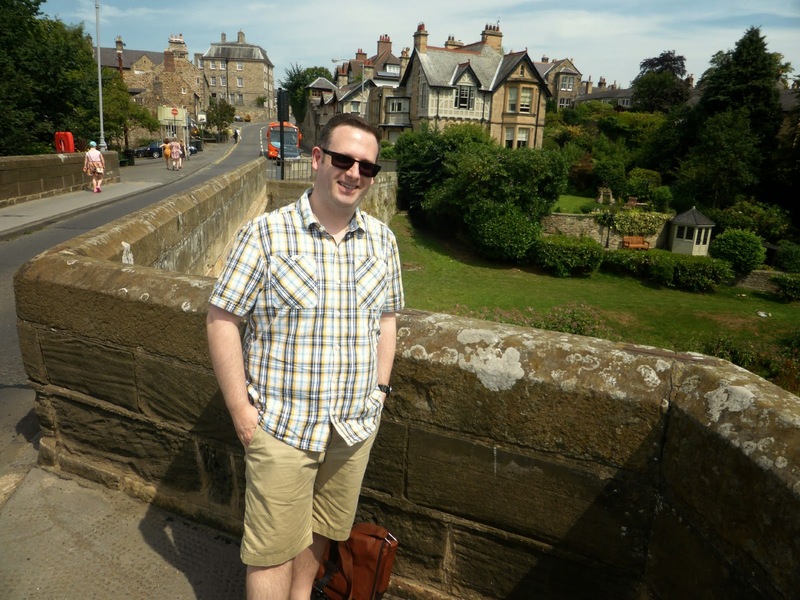 We had a really enjoyable and relaxing wander in Corbridge and it's definitely one of my favourite places to visit in the North East. If you live in this part of the country or plan to visit make sure you find some time to get yourself there. This reminds of the 'old' part of my home town! I love that England has so much history and pretty old buildings. 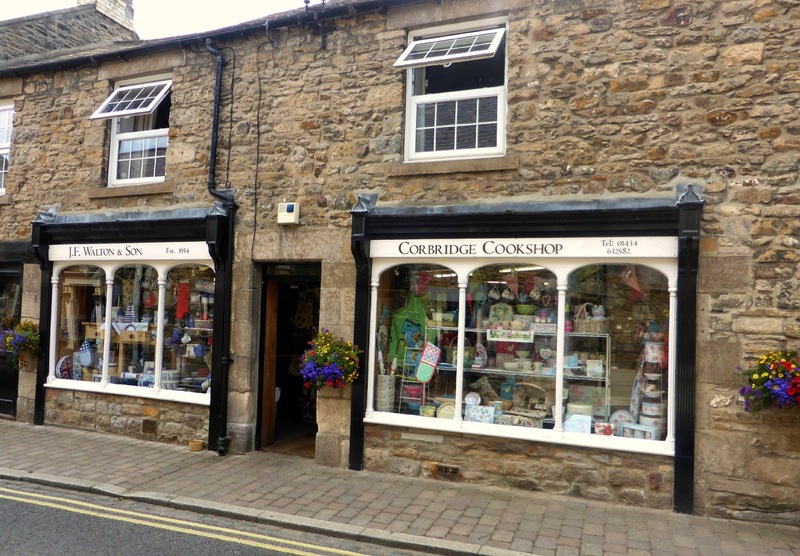 I have never been to Corbridge, but you have made me want to go for sure. I love old towns like this, and browsing the little cute shops. It is so nice to see Corbridge from a visitors perspective. I miss being able to meander about Corbridge. I love Northumberland and I love Hadrians wall so maybe Jake and I should take a day trip here too. Nice to see you had such a lovely sunny day to visit! I love Corbridge! We went over Easter and had a lovely morning wandering the streets and shops. Did you go into Forum Books? It may be my favourite book shop! I love love LOVE Corbridge. Did you pop into RE? I could spend a fortune in that shop. I love the Angel Inn too. I need to go and try the cocktails there sometime. They look so good.